Neodymium was discovered in 1885. It is a highly reactive metal and gets tarnished in air. It is main component of didymium glass. NIB magnets (Neodymium, iron and boron) are used in computers, cell phone, motors and audio system. Neodymium was discovered in 1885 by Baron Carl Auer Von Welsbach in Vienna. He separated neodymium and praseodymium from didymium through fractional crystallization of the double ammonium nitrate tetrahydrates from nitric acid, also following the separation through spectroscopic analysis. The word neodymium has been derived from Greek word neos meaning new and didymos meaning twin . In 1950s, commercial purification of neodymium was carried out through ion-exchange method by Lindsay Chemical Division. In 1927, commercially neodymium was used as glass dyes. Neodymium glasses were made in 1930s which has a reddish or orange tinge due to the traces of praseodymium but now a days the glass color is purple due to fractional crystallization technology. Neodymium is an abundant metal and is present in about 3.8 mg/kg in the Earth crust. It is twice more abundant than lead in the igneous rocks of the earth crust and half as plentiful as copper . Neodymium is not found in free or elemental form in nature. It is usually found in the form of ores like monazite and bastnaesite. It belongs to the rare earth metal group, but it is not rare in nature. The largest deposits of neodymium in the world are present in China, United States, Brazil, India, Sri Lanka and Australia. Neodymium is a bright silver metal with a luster. It exists in two allotropic forms: α and β. Neodymium has chemical symbol is Nd with atomic number 60. Its atomic weight is 144.24. Its density at room temperature is about 7.01 g/cm3. Its melting point is 1024OC. Boiling point of neodymium is about 3074OC. Neodymium is a very reactive lanthanide rare earth metal. Neodymium metal tarnishes in the air. It burns readily to form neodymium (III) oxide at about 150OC. It is quite electropositive element and reacts slowly with cold water and quickly with hot water to form neodymium (III) hydroxide. Neodymium reacts vigorously with all halogens. Neodymium dissolves in dilute sulfuric acid and form solution that contain the lilac Nd (III) ions. Neodymium mostly exist in +3 oxidation state and it forms compounds including halides, oxides, sulfides, nitrides, hydroxide phosphide and sulfate. Neodymium compounds have colors which depend upon the type of lighting. Most of its salts are pale purple in color. Neodymium-doped glasses are used in laser that emit infrared with wavelength between 1047 and 1062 nanometer. Neodymium is also a component in alloys to make high strength magnets. Neodymium magnets are used in microphone, head phone, loudspeakers and computer hard disks. It is also used with other substrate crystals in Nd-YAG laser (Neodymium: yttrium aluminum garnet). This laser emits infrared at a wavelength of 1064 nanometer, used in solid-state laser. Neodymium acts in similar way as Ca2+ in promoting the growth of plants. Neodymium is used to determine the age relationships of rocks and meteorites. 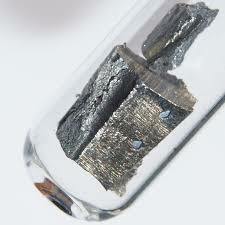 Neodymium is used in the electric motors of hybrid automobiles. It is also used to color the glass in different shades ranging from pure violet with the help of wine red and warm gray. Neodymium is also used to remove green color from glass due to iron contaminants. Neodymium is component of didymium that is used to make welder’s and glass blower’s goggles. Neodymium glass is used in incandescent light bulbs. Its salts are used as colorant for enamels. Neodymium is used in the manufacturing of house hold equipments like color television, lamp, energy saving lamps and glasses. Neodymium has no biological role. The salts and neodymium dust is very irritating for eyes. Compounds of neodymium are toxic if they are soluble in water but non-toxic if they are insoluble. It is dangerous in working areas and considered as a work hazard as it can cause lung embolisms due to long term exposure . Neodymium has five stable isotopes: 142Nd, 143Nd, 145Nd, 146Nd and 148Nd. Neodymium-142 is the most abundant isotope. It has two radioactive isotopes: 144Nd and 150Nd. 144Nd have half-life of 2.29×1015 years and 150Nd has half -life of 7×1018 years approximately.
. John Emsley (2003). Nature’s building blocks: an A–Z guide to the elements. Oxford University Press. pp. 268–270.